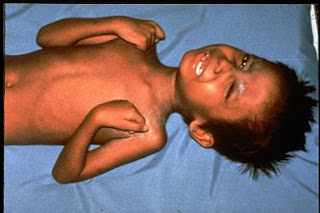 Tetanus is a medical condition characterized by a prolonged contraction of skeletal muscle fibers. The primary symptoms are caused by tetanospasmin, a neurotoxin produced by the Gram-positive, rod-shaped, obligate anaerobic bacterium Clostridium tetani. Clostridium tetani spores can be found most commonly in soil, dust and manure, but also exist virtually anywhere. If deposited in a wound the neurotoxin interferes with nerves that control muscle movement. Tetanus is a life-threatening disease and sometimes, a person dies despite prompt medical attention. Vaccination, if the adult hasn’t had a booster shot in the previous five years. 1. Ineffective Airway Clearance related to accumulation of secretions result of damage to the muscles of swallowing. 2. Acute Pain related to injury agents (biological). 3. Risk for Aspiration related to loss of consciousness, swallowing disorders. 4. Ineffective Tissue Perfusion related to damage to transport oxygen through the alveolar and capillary membranes. 5. Risk for Injury related to an increase in muscle coordination (convulsions), irritability. 6. Imbalanced Nutrition, Less Than Body Requirements related to decreased swallowing reflexes, less intake. 7. Risk for Infection related to immune primary, invasive procedures. 8. Impaired Swallowing related to neuromuscular damage swallowing muscles. 9. Impaired Urinary Elimination related to damage to sensory motor. 10. Self Care Deficit related to weakness, illness. 11. Knowledge Deficit: about the disease and treatment related to lack of exposure to sources of information. 12. Impaired Verbal Communication related to decreased blood circulation to the brain.